Deadline Extended for the Fall St Sergius Student Conference at Holy Trinity Seminary. 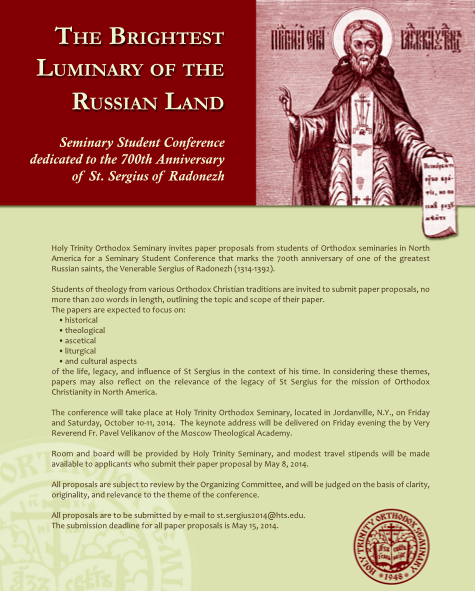 The Organizing Committee for the Seminary Student Conference in honor of the 700th Anniversary of St Sergius of Radonezh announces that the deadline for submission of paper proposals is extended until JULY 18, 2014. The conference will take place at the Holy Trinity Monastery at Jordanville, NY on October 10-11, 2014. We encourage the students of the Orthodox seminaries in North America, as well as the students and scholars of Orthodox theology to submit their paper proposals concerning the life and legacy of St Sergius of Radonezh, and to use this unique opportunity to visit Holy Trinity Monastery in Jordanville, NY - one of the most renowned centers of monastic life in North America. The Brightest Luminary of the Russian Land: Seminary Student Conference dedicated to the 700th Anniversary of St. Sergius of Radonezh. Holy Trinity Orthodox Seminary invites paper proposals from students of Orthodox seminaries in North America for a Seminary Student Conference that marks the 700th anniversary of the greatest Russian saints, the Venerable Sergius of Radonezh 1314 - 1392). Students will present their paper at the Conference from October 10-11, 2014. For more information in Russian click here.